I heard about this book on Spycast, the weekly podcast from the International Spy Museum in Washington, D.C. It's a great resource for learning about world history, the intelligence and defense communities, policy, techniques, portrayal in the media, and of course books about all aspects of espionage. Put together by Dr. Vince Houghton. I'm a fan. The interview with author Jason Fagone is one of the most accessible I've heard; easy listening (less wonk). What motivated this man to write this book about this woman is a sweet anecdote, and there are interesting tales about his research for the book and how it came together. It's a great story, if a bit bittersweet. As a woman, it is emotional work to reckon with yet another instance of one of us being devalued and diminished because of her gender. But let's take delight that someone did find this story, did the extensive research, honored her life in great detail, and made her inspiration available to the world. The Woman Who Smashed Codes was Elizebeth Friedman, (yes, Elizebeth with three e's). She was a cryptanalyst who did amazing things, played a huge role in the course of the United States in wars and law enforcement, but whose achievements were hidden away, at first because of the nature of her work, but even after her death and the declassification of information which made her story available, because she was just the wife of William Friedman, legendary chief cryptologist at the newly formed NSA in 1952. As I was reading this book, I went back to another book on cryptography that I read, Simon Singh's The Code Book: The Science of Secrecy from Ancient Egypt to Quantum Cryptography, to see what I may have read about her, or even him, already. The index lists only "Friedman, Colonel William 92-4". This is the chapter on the Beale Cipher, Le Chiffre Indéchiffrable, and it describes William as, "the dominant figure in American cryptanalysis during the first half of the twentieth century." It goes on to note, "The Friedman archive ... frequently consulted by military historians." Note that the Friedman archives include, now, William's documents at the NSA and both William and Elizebeth's individual collections at the George C. Marshall Foundation in Lexington, VA. The only mention of Elizebeth is leading into that information, stating, "...as his wife once said, he believed the ciphers to be of 'diabolical ingenuity, specifically designed to lure the unwary reader.'" Yeah. His wife. She existed. 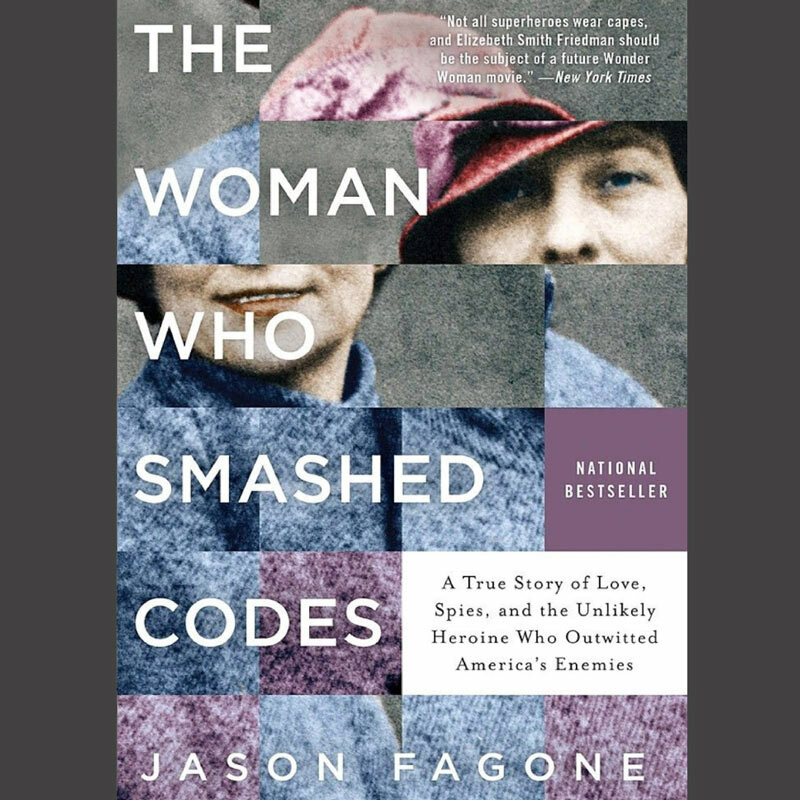 And if you read or have read, The Woman Who Smashed Codes, you will know the massive contribution she made to the field of cryptanalysis, the lives she saved, the battles her decrypts influenced and helped win. Oh and the beginning. Well, there was a glorious serendipity that set her on a course of opportunities and adventures, and it makes my heart soar to know such things could and actually have happened to anyone ever. She found herself living in a rarefied and remote location in pursuit of science - which, that happened to me once, and it was the most magical time of my life - but in her story, she participated in the science. And she fell in love, as did I, but her love became a marriage and a family and a life of great consequence. Fagone is a seasoned and capable writer. It's a very readable book, and in fact, I took my time with it on purpose because I wanted the experience of the story to last. I have only one assessment about the writing, which is the narrative has a number of adulating flourishes, and they're repetitive enough to notice. But they were just noticeable, but it was overall a charming and heartening story and such a gallant project. When I realized how much of the book is comprised of the Acknowledgments, Notes and Index (a full quarter of the hardback edition, by eye), I marveled at the discipline, organization and energy it must have taken to research so much information, especially that which has not been otherwise widely covered, and put it all together in a clear, linear story that is a true joy to read. His poetic waxing of just how awesome and important Elizebeth was is the wabi sabi of an otherwise perfect book, and I'm amazed it was reined in as well as it was. It couldn't have been easy.